APRIL 29— In demolishing his own Discus Throw National Record, Central Arizona College freshman Eldred Henry became one of a select few Caribbean athletes to crack the 200’ barrier for the first time in his career on Saturday. 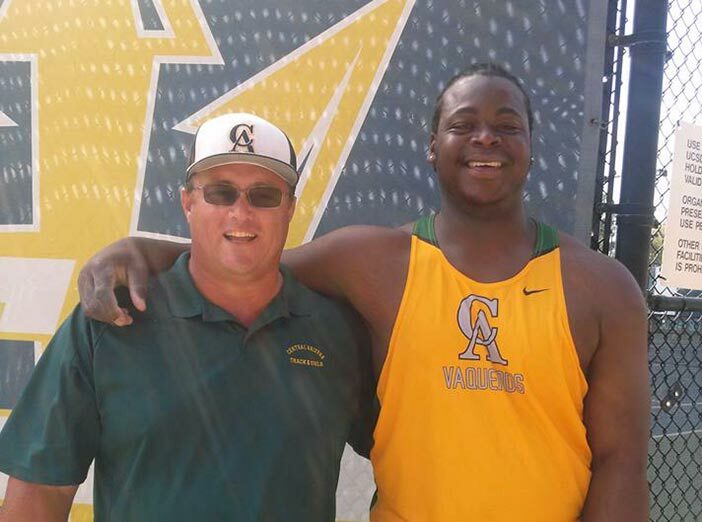 Competing against the pros at the Trinton Invitational at UC San Diego on Saturday, the 6’5” specimen who tips the scales at 350 lbs, sent his implement sailing out to 61.90m (203’1”) to finish sixth overall. His mark came a day following a 5-hr drive to the US Olympic Training Center in Chula Vista, California, where the threw 56.90m less than 2-hrs after he arrived. Henry—who began competing a year ago and is in his first year of using the Sr. implements—attributes his progression from a 51.76m opening throw to 61.90m to film study. After his mammoth throw, Henry is currently ranked #24 on the IAAF World list—the second highest ranking BVI athlete behind sprinter Tahesia Harigan-Scott who is tied for #17 in the 100m with her 11.29 seconds mark. She’s also #52 in the 200m with her 23.33 seconds time. At Monday’s Miramar Multicultural Games, she ran a wind assisted 11.17 seconds to win the 100m as she prepares to run in China next month. Elsewhere, sprinter Karene King is coming off equaling her 100m best of 11.52 seconds at the Mt. SAC Relays and she was fourth in her 200m heat in a wind aided 23.40 seconds. In the same competition, Long Jumper Chantel Malone was fifth with a leap of 6.16m.